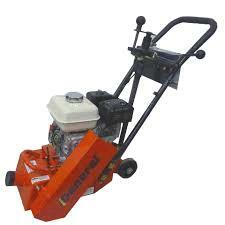 USES: REMOVING COATINGS, CLEANING CONCRETE & ASPHALT, REMOVAL OF TRAFFIC LINES, ETC. FLAILS SHOULD LAST FOR SEVERAL HOURS ON AVERAGE. WILL SCARIFY APPROXIMATELY 350-500 SQ. FEET PER HOUR AT A DEPTH OF 1/8". * Please call us with any questions you may hav about our scarifier concrete gas rentals in Wayzata MN and the Western suburbs of Minneapolis.